What are floaters? Many patients complain of varying particles or debris which appear in their vision. These typically occur one eye at a time. Patients report debris which may look like a black dot, a strand of hair, an amoeba, or even "lint". Some of our patients will report flashing lights in the dark often associated with the floater symptoms. So where do these symptoms come from and why are they important? There is a gel in the back of the eye called the vitreous which is attached to the retina (back surface of the inside of the eye). With time or trauma, the gel can break down and pull forward. When light enters the eye, it will now reflect off the gel which is in front of the retina and cast a shadow. The shadow may have an appearance like the symptoms discussed above. Since the gel is still connected in other areas to the retina, the movement of the gel "tugs" on the retina causing flashing lights which are more noticeable in the dark. At these points of attachment where the gel is tugging on the retina, there is always a chance that the retina could tear possibly resulting in a retinal detachment. Retinal detachments can be vision threatening an often require surgery. Retinal tears caught early often can be treated just with laser and may not require surgery in the operating room. The greatest risk for a retinal problem is in the first 4 or 5 weeks after the appearance of a new floater. Myopic or near sighted patients are also more prone for developing retinal problems from floaters. If a new floater appears, you should call your eye care professional immediately and have an evaluation to rule out any retinal problem. 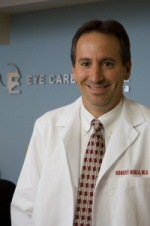 We typically will check the patient with a dilated eye exam and then do a follow up exam 3 or 4 weeks later. The patients are instructed to call immediately if they experience any increase in floaters or flashing lights, decreased vision or change in their side vision. Remember, protect those eyes! !